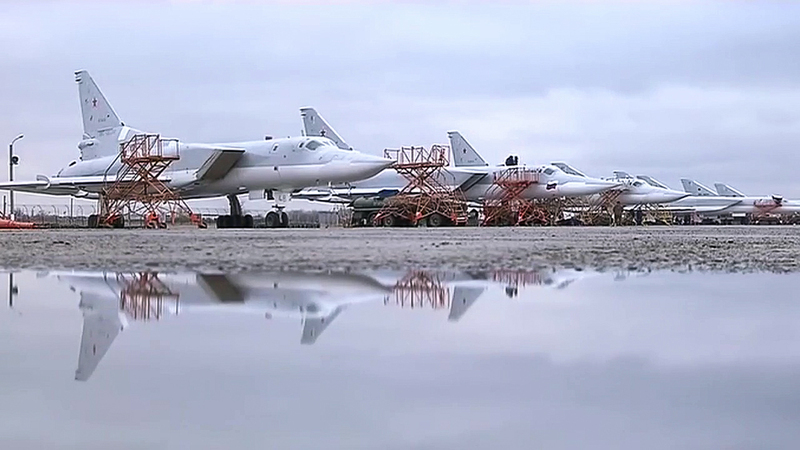 Russian Tupolev Tu-22 M3 strategic bombers in Syria. Six long-range Tu-22M3 bombers of Russia’s Aerospace Forces used high-explosive ammunition to hit terrorist facilities in Syria in the morning of July 12, Russia’s Defense Ministry said in a statement obtained by TASS. "In the morning of July 12, six long-range Tu-22M3 bombers, which took off from the home airfield on the territory of the Russian Federation, delivered a combined strike with high-explosive ammunition at facilities of the ISIS terrorist group (former name of the Islamic State terrorist organization) east of Palmyra and As-Suhnah," the statement said. The ministry said a large field camp of militants, three ammunition and armaments depots, three tanks, four infantry combat vehicles, eight vehicles equipped with heavy machineguns, as well as "a great amount of enemy manpower" were destroyed. "All aircraft safely returned and landed at their airfields," the statement said. The Defense Ministry said representatives of the international coalition, who are also involved in hostilities against the Islamic State in Syria, were in advance informed of the time of strikes and transit corridors of Russian long-range bombers. A truce is currently underway in Syria; as of July 11, a total of 179 inhabited localities joined it. The ceasefire regime took effect in Syria on February 27. Shortly before, the UN Security Council adopted a resolution supporting a cessation of hostilities. The document drafted by Russia and the United States was backed by all 15 Security Council member states. The ceasefire regime does not cover the Islamic State and Jabhat al-Nusra terrorist organizations as well as other groups ruled terrorist by the Security Council.